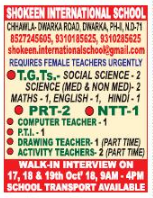 Shokeen International School, New Delhi has advertised in THE HINDUSTAN TIMES newspaper for recruitment of Teachers TGT / PET / Other Teachers jobs vacancies. Interested and eligible job aspirants are requested to walk-in on 17th, 18th and 19th October 2018. Check out further more details below. About School: Shokeen International School, extends beyond its institutional dimension and promises hope, fulfillment and an all around development. It offers incomparable platform to channelize many young minds towards their future dreams. It instills in every spirit, the fervor to forge ahead and be a life-long learner. How to Apply: Interested and eligible candidates are requested to attend the Walk-in interview along with their CV, originals / copies of certificates and recent PP size photos to the walk-in address provided here.